So, I've had a little impromptu blogging break! I didn't mean to, but the holidays have just flown by and I kept meaning to put posts together about various things and the next thing I knew, it's Sunday evening and it's back to work tomorrow. Anyway, I was thinking that I often mention the hubby on here, but I have never really said anything about him. My posts always tend to centre around Charlie. 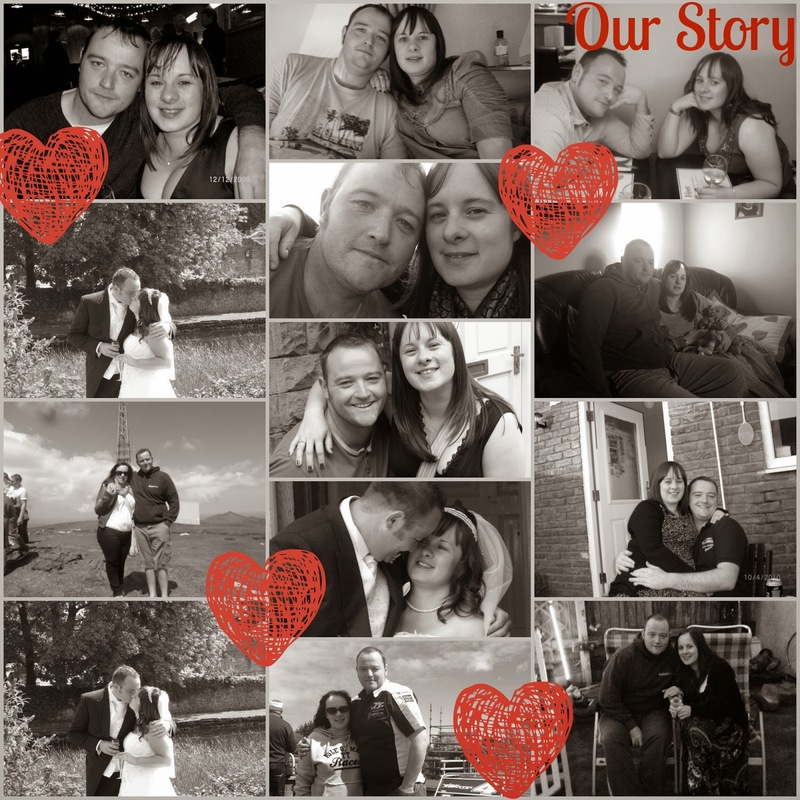 So I thought that I would introduce you to the hubster and tell you how we met. You might know, the hubby is Tom. He is 32 and works in the same school as me. He isn't a teacher; he is a Learning Support Assistant in the Special Unit. That means he works with students who have severe disabilities or needs. For example students with Down Syndrome or who are mute etc. I think he is really good at his job. It is through work that we met. Unbeknown to us (at the time), the hubby and I both started our new jobs in September 2007 at the same school. I saw him around from time to time and knew him as an LSA, but our paths never crossed. He would always smile in the corridors, but I never thought anything of it. Until. One evening in November 2009. I had moved into a flat on my own after spending two years living with other people. It was a Friday night and I was on Facebook. A friend had put some status up about having a little drink and I commented on it. So did Tom. Again, thought nothing of it. But then he requested me as a friend and I accepted immediately. We started messaging and he invited me around for a drink. It was late and I had already had a drink so couldn't drive, so I declined, but he said if I was in town the day after, to pop in for a brew. And so I did. He lived in a swanky new studio apartment on the promenade and I loved it. It was tiny, but it was swish. So I went for a cuppa and a chat and he told me about his daughter from a previous relationship and something seemed to click. He was so nice. He was funny and affectionate and he wanted to see me more. He asked me to go round that night but I was going out for some one's birthday. He said to pop in on the way back, so again, I did. We had a drink and a bit of a kiss and I went home on a high! For the next few weeks we were inseparable. I was practically living at his and when I wasn't staying there he would message me constantly saying how much he missed me. We generally just stayed in his apartment, drinking red wine and getting take aways and watching films. We went to the comedy club a few times and I remember he drew a heart on the ticket whilst we there. I met his daughter just before Christmas and really hit it off with her; the three of us went out for a Sunday roast and I remember, when I went up to pay, she grabbed my hand and came with me. I think that was the testing point but it worked and things got much more serious after that. As it was coming up to the holidays I was due to go back home (I never stayed on the Island for the holidays, I always went back to my parents). As the time approached, both of us were feeling sad that we wouldn't get to spend Christmas together. He took me to the airport with his daughter and I let him borrow my posh car for the two weeks (I had a convertible back then!). On Christmas Eve, over the phone, he told me he loved me. So I asked him if he would like to come over and meet my family! He did. He booked the ferry and came over the day after boxing day. He was a hit with my parents immediately. They thought he was lovely and he was so relaxed around them. Everything was just working out right. After the holidays, I barely went back to my own flat. The day of the new school term it snowed and school was shut for two days! We had his daughter as her mum still had to go to work and we spent the days building snowmen and drinking hot chocolate. One night towards the end of January as we were drifting off to sleep, he said he loved me, which he had been doing quite often. I said it back and he said "I love you more" to which I replied "prove it." His response was "marry me"!! I said OK and that was that! The day after I told my friend at school, who thought I was complete nuts. But I just knew that it was right. I had to check with him that he hadn't just been saying it, but no he was sure and that weekend he took me to a jewellers to choose a ring. He proposed officially at the Chasms; a beautiful area on the Isle of Man overlooking the Irish Sea. It was quick, but we knew it was right. However, I was absolutely terrified of telling my parents. I had done some things in the past they hadn't agreed with and I thought they would think I was being reckless again. But I knew this was the real thing. I needn't have worried; they were delighted and also relieved that I wasn't pregnant as I said I had something to tell them! My parents said they would pay for the wedding and we all agreed the date: Saturday 30th July 2011. The count down was on! We booked a holiday for Easter and took his daughter with us. My parents had met her a few times by then and adored her. He also spent Christmas 2010 at my parents and it was wonderful. A few months before the wedding, my Grandma got ill and died. Tom was amazing at the time and really helped me. He even took the time off work to get to the UK with me for the funeral. And then, we got married! We knew that pretty soon after getting married we wanted a baby. It took a few months, but by June 2012 we got the positive pink line and Charlie was on his way. It's not been easy since we met; we have had a lot to deal with. His ex is the cause of MUCH chaos and stress. Nothing to do with me, she's not jealous or anything. But she is so incredibly selfish over her daughter and begrudges the time Tom has her. We've also had my Grandma dying. My Grandad having cancer. An accident that damaged Tom's neck and back. And then of course, having to be rescued from our house when we were snowed in last year. He's not perfect either (no one is!) and of course I get stressed that he's left his socks BY the washing basket instead of IN it again. But I wouldn't have it any other way; I love him to pieces. I like our story. It happened quick, but it was right and here we are four years later nearly! I love a good love story - how did you mean your hubby or partner? ?